Larger capacity which is up to 10lbs. One side of washing, one side of spinning. Built in Pump for easy upper drainage. 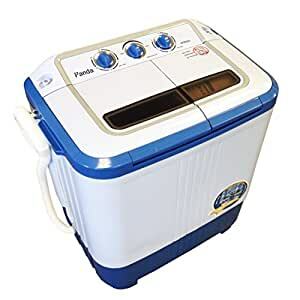 Perfect for Apartments, Dorms, RV, Travel, your second washer at home. Please understand it’s not a fully automatic washer, you may need a little more work between washing and spinning. Inlet hose: If it doesn’t match with your tap, please just use the bucket to fill into the tub directly. Drain hose: The drain hose must reach a height of at least 20cm (7.87inch) minimum and 80cm (31.50inch) maximum. Please hang nook over side of sink, bathtub. However, Placing the drain hose a little bit low gets the best result for drain. We guarantee all washers are brand new. If you find some water or dark watermarks left on hoses or tubs, it’s manufacture function testing. The washer has firm cushion and double-box packaging without showing any washer-related words on the outside box. IMPORTANT: Do not immerse washer into water or put it on wet surface. Malfunction can be occurred once any water gets into mechanic parts at the bottom of washer.